Fiber optics is full of jargon but it's important to understand it. One of the more confusing terms to many is "wavelength." It sounds very scientific, but it is simply the term used to define what we think of as the color of light. Light is part of the "electromagnetic spectrum" that also includes x-rays, ultraviolet radiation, microwaves, radio, TV, cell phones, and all the other wireless signals. They are simply electromagnetic radiation of different wavelengths. We refer to the range of wavelengths of electromagnetic radiation as a spectrum. Wavelength and frequency are related, so some radiation is identified by its wavelength while others are referred to by their frequency. For the radiation of shorter wavelengths, light, UV and x-rays, for example, we generally refer to their wavelength to identify them, while the longer wavelengths like radio, TV and microwaves, we refer to by their frequency. The light we are most familiar with is, of course, the light we can see. Our eyes are sensitive to light whose wavelength is in the range of about 400 nanometers (billionths of a meter) to 700 nanometers, from the blue/violet to the red. If you wonder why this is the range of colors we can see, it's because it is the same region as the brightest output of the sun. In other words, we developed sight in the spectral range of the output of our local star, quite a good idea actually. For fiber optics with glass fibers, we use light in the infrared region which has wavelengths longer than visible light, typically around 850, 1300 and 1550 nm. Why do we use the infrared? Because the attenuation of the fiber is much less at those wavelengths. The attenuation of glass optical fiber is caused by two factors, absorption and scattering. 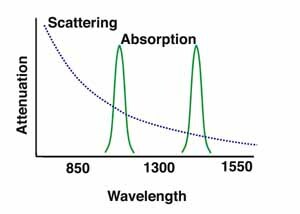 Absorption occurs in several specific wavelengths called water bands due to the absorption by minute amounts of water vapor in the glass. Scattering is caused by light bouncing off atoms or molecules in the glass. It i s strongly a function of wavelength, with longer wavelengths having much lower scattering. Have you ever wondered why the sky is blue? It's because the light from the sun is more strongly scattered in the blue. Fiber optic transmission wavelengths are determined by two factors: longer wavelengths in the infrared for lower loss in the glass fiber and at wavelengths which are between the absorption bands. Thus the normal wavelengths are 850, 1300 and 1550 nm. Fortunately, we are also able to make transmitters (lasers or LEDs) and receivers (photodetectors) at these particular wavelengths. If the attenuation of the fiber is less at longer wavelengths, why don't we use even longer wavelengths? The infrared wavelengths transition between light and heat, like you can see the dull red glow of an electric heating element and feel the heat. At longer wavelengths, ambient temperature becomes background noise, disturbing signals. And there are significant water bands in the infrared. Plastic optical fiber (POF) is made from materials that have lower absorption at shorter wavelengths, so red light at 650 nm is commonly used with POF, but at 850 nm attenuation is still acceptable so short wavelength glass fiber transmitters may be used. We often refer to wavelengths in fiber optics. The wavelengths we use for transmission must be the wavelengths we test for losses in our cable plants. Our power meters are calibrated at those wavelengths so we can test the networking equipment we install. The three prime wavelengths for fiber optics, 850, 1300 and 1550 nm drive everything we design or test. NIST (the US National Institute of Standards and Technology) provides power meter calibration at these three wavelengths for fiber optics. Multimode fiber is designed to operate at 850 and 1300 nm, while singlemode fiber is optimized for 1310 and 1550 nm. The difference between 1300 nm and 1310 nm is simply a matter of convention, harking back to the days when AT&T dictated most fiber optic jargon. Lasers at 1310 nm and LEDs at 1300 nm were used in singlemode and multimode fiber respectively. Recent telecom systems use wavelength-division multiplexing (WDM), either DWDM (dense WDM) or CWDM (coarse WDM). In these systems, lasers are chosen with precise wavelengths closely spaced - but not so close they interfere with each other - and transmitted simultaneously on a single fiber. It's just like the FM radio spectrum. WDM can use the full range of wavelengths between 1260 and 1670 nm in various bands. More on the wavelength bands used in SM fiber. The final note is on safety. Look closely at the first drawing above. The visible spectrum is well below the wavelengths used in fiber optics. That means you generally cannot see the light in fiber systems, so there is no reason to look into the end of a fiber to see if there is a signal. Some fiber optic systems like CATV and DWDM do have enough power to be potentially dangerous, so you should never look at the end of a fiber. Jim Hayes is the founder of Fotec, the fiber optic test equipment company and Cable U training sold to Fluke Networks in 2001. Find him at www.JimHayes.com. VDV Works creates training programs and technical content for fiber optics and voice-data-video cabling.